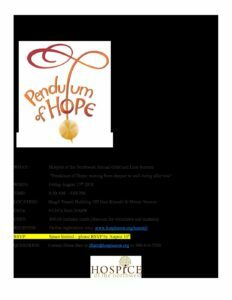 Multiple experts in the bereavement field such as Lynda Cheldelin Fell and Dr. Bob Baugher will provide practical strategies for moving from despair to well-being. This educational summit is open to the public and especially recommended for social workers, therapists, long term care workers, medical employees, teachers, veteran advocates and anyone working with people whose lives have been touched by loss. Registration is online at www.hospicenw.org/summit. RSVP by August 10th, however we recommend registering promptly as space is limited. This will be a full day of interactive information and each participant will receive a certificate for 4 continuing education units from NASW. We look forward to seeing you there.